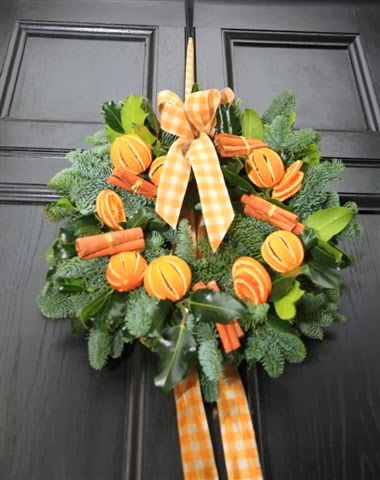 Next on our Christmas list was our very first (and hopefully the first of many) Luxury Door Wreath Workshop. Hosted by the delightfully brilliant Joanna McCrea from Ripon's Twisted Willow floristry, five willing - and as it turns out, highly talented - participants arrived for coffee and mince pies at 10:00am. By 1:00pm there were five perfectly crafted door wreaths on display! The greenery came from the Estate and the lovely bits and pieces were supplied by Joanna with "extras" - including battery powered fairy lights - were also available. Lunch was served in the Great Hall and the day was rounded off with a tour of the Hall by one of our knowledgeable guides. Flowers By... is a series of workshops that we are very much looking forward to expanding on in the new year. What a great idea! This workshop sounds like something I'd love to do - if only I wasn't so far away.